Blanked for two straight games, the Wood River High School boys’ varsity soccer team tried to revive its inconsistent offense Tuesday night with a “Senior Night” engagement against the defending State 4A tournament champion Jerome Tigers, in Hailey. Jerome (11-1-0, 8-1-0, 24 points) entered the game on a six-game winning streak during which the Tigers have outscored opponents 22-3. The only Jerome loss was 4-3 at home to Canyon Ridge Sept. 11. For the season, Jerome has outscored opponents 50-9. Coach Robert Garcia’s Tigers needed a win or tie against Wood River to nail down the No. 1 seed for the six-team Great Basin Conference tourney starting Thursday, Oct. 9 with two first-round games. Canyon Ridge (13-2-0, 7-2-0, 21 points) hosted Minico (1-12-1, 1-8-0) on Tuesday. The No. 3, No. 4 and No. 5 tournament seeds and match-ups for Thursday’s tournament games would only be finalized after Tuesday’s games between Wood River and Jerome, and Burley (4-8-0, 3-6-0, 9 points) hosting Twin Falls (5-8-2, 4-5-0, 12 points). Wood River (6-7-0, 4-5-0 league) will play a tournament game Thursday, at 2:30 p.m. on the Hailey pitch if the Wolverines earn the No. 4 seed. 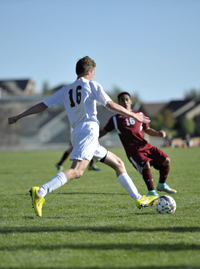 Last Thursday, the visiting Canyon Ridge Riverhawks avenged a 4-1 home loss to Wood River Sept. 16 with a dominating 1-0 league victory at South Valley Sports Complex soccer field. The ‘Hawks claimed most of the ball possession. They out-shot Wood River 10-1 in the first half and 14-2 for the game. Senior Cristian Muniz scored on a fine individual effort in the 35th minute for the eventual game winner. Making sure Wood River stayed close was senior goalkeeper Kyle Weller (11 saves, 7 in the first half). The Wolverines of coach Luis Monjaras played better in the second half and nearly equalized when junior Danny Graves rattled a shot off the crossbar in the 75th minute. The result was a second straight 1-0 loss, the previous one at Burley Sept. 30.